Ice cream cones handed out warmly, movies you can blaze through in 10 minutes, jungle filled front yards and singing in perfect harmony with someone we love -- there are many beautiful happinesses and these ones are ours. This episode of Happiness Spells was arranged, recorded and produced by Amanda Meyncke in Los Angeles, California. Our music is by Chris Zabriskie. Happiness Spells is five minute lists of happy and positive things, set to gentle music. Some serious. Some not so serious. A collection of thoughts, daydreams, feelings and reveries. Headphones on. There's nothing else like it. Happiness Spells is five minute lists of happy and positive things, set to gentle music. Some big, some small, all special. A collection of thoughts, daydreams, feelings and reveries. Headphones on. There's nothing else like it. This episode of Happiness Spells was written and produced by Amanda Meyncke in Los Angeles, California along with Little Everywhere. The music in this episode is by Dann Gallucci. A Very Detailed List of Everything I'd Like to Do With You. Happiness Spells is five minute lists of happy and positive things. Some serious. Some not so serious. A collection of thoughts, daydreams, feelings and reveries. Headphones on. A hint of #ASMR, a touch of #guidedmeditation, a lot of #gratitude. Find Happiness Spells on Instagram or visit our site to send us a message. Happiness Spells is five or so minutes of happy and positive things, a collection of thoughts, daydreams, feelings and reveries. Headphones on. A hint of #ASMR, a touch of #guidedmeditation, a lot of #gratitude. Find Happiness Spells on Instagram or visit our site to send us a mysterious message. This general episode has to do with kindness, voting, water balloon fights, early morning fog and our powerful connection to each other. One of the most soothing sets of spells we've done in a long time, from cats in tiny boxes to Turkish rugs on the ground, the future is beautiful and the most beautiful thing is you'll be there with me. Happiness Spells is five minutes of happy and positive things, a collection of thoughts, daydreams, feelings and reveries. Headphones on. A hint of #ASMR, a touch of #guidedmeditation, a lot of #gratitude. Find Happiness Spells on Instagram or visit our site for more ways to listen. Happiness Spells is five minutes of happy and positive things, a collection of thoughts, daydreams, feelings and reveries. Headphones on. A hint of #ASMR, a touch of #guidedmeditation, a lot of #gratitude. Birthdays are a bit of my favorite magic, and here's a list of spells for a perfect birthday. It's 11:11, Make A Wish. Happiness Spells is five minutes of happy things, a collection of thoughts, feelings and reveries. Headphones on. It's 11:11, make a wish as you saunter beneath jacaranda trees and stop in at the neighborhood library. A hint of #ASMR, a touch of #guidedmeditation, a lot of gratitude. Happiness Spells is written, recorded and produced by Amanda Meyncke in Los Angeles, California. Our music is by Chris Zabriskie. Happiness Spells is written, recorded and produced by Amanda Meyncke in Los Angeles, California. Our music is by Chris Zabriskie. Special sounds via FreeSound.org, and Kangaroo Vindaloo. A hint of ASMR, a touch of guided meditation, a lot of gratitude. This episode features the writing of Mary Jeys, a Bay-area artist and thinker. Artist's paintbrushes, palettes, making and creating art. Happiness Spells is five minutes of happy things, a collection of thoughts, feelings and reveries. Headphones on! Happiness Spells is five minutes of happy things, a collection of thoughts, feelings and reveries. Headphones on, makes it so much better. A hint of ASMR, a touch of guided meditation, a lot of gratitude and joy. Happiness Spells is five minutes of happy things, a collection of thoughts, feelings and reveries. This episode was written by Bethany Wearden, a writer and creative living in Los Angeles. Headphones on. Spells will be read, separated by moments of stillness to give you the space to think. A hint of ASMR, a touch of guided meditation, a lot of gratitude. Happiness Spells is written and produced by Amanda Meyncke. Music is by Chris Zabriskie. Happiness Spells is five minutes of happy things, a collection of thoughts, feelings. memories and moments. 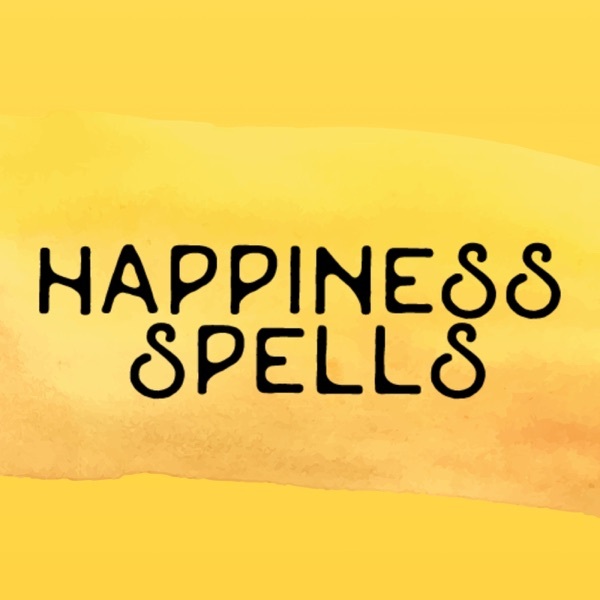 Happiness Spells is written and produced by Amanda Meyncke in Los Angeles, California.